“Contributing to”―Foolish Words in the Climate Change Debate | Watts Up With That? Originally published in World Net Daily. July 5, 2018 in Opinion. “Contributing to” are weasel words. My own ‘favorite’ weasel words are “consistent with”. When I read about scientific evidence in a criminal trial, the words ‘consistent with’ often occur. “The sun rises in the east” is also consistent with criminal activity. All “consistent with” means is that it doesn’t prove the opposite. My favorite example. Red fibers found at the crime scene were consistent with the clothing worn by the accused. Yeah but the red fibers in question came from the sweater of an incompetent lab tech. Thats about as weasily as it gets. SMH. With articles like this, the NYT’s is contributing to The Stupid, now at epidemic levels. Average slot machine uses up to 250 watts continuous. I was wondering the other day about how much power and energy it takes to play a night game of baseball? Climate alarmism is contributing to scientific illiteracy. The arrow of causality is dominate toward alarmism, but does go both way in feedbacks. Is there such a thing as “back alarmism” — where, when a person expresses alarm over climate change to a friend, the friend becomes alarmed, and some of the friend’s alarm comes back at the original person, making him even MORE alarmed ? Or, alternately, can the alarmed friend’s alarm slow the dissipation of the original speaker’s alarm, to prevent him from calming down as fast as he would otherwise calm down ? You may have just identified the only positive feedback in all of climate!!! RK: I believe that you have discovered a new phenomena called “Standing Wave Alarmism”. I think this needs more research! It’s two waves out of phase, so all I hear is silence. Climate alarmism is the overwhelming cause of scientific illiteracy closely followed by glib reference to ‘experts’. I believe the overwhelming cause of stupidity in the populace is the MSM. All newspapers and television. (Tabloids and specialist magazines may be exempt). The school system adds 20% to that, but the universities in my opinion add 40% to that. The unis these days are completely nuts. Indeed. The difference between a standard education and a quality education is te difference between being taught what to think and being taught how to think, the difference between learning by rote and learning by critical examination. Original research has to be done by critical thinkers from first principles. I would prefer t0o say that climate alarmism is in fact highlighting just how much scientific illiteracy there is – even among qualified scientists! Another very useless word is “suggests”. Nah. I “suggest” that you reconsider. Thanks, I did reconsider and you quoted me incorrectly. So your post suggests you wanted to be snarky and not contribute to the conversation. Which is easily replaced with “I believe that”…. Just change the subject to religion and see how easily that applies. Things are actually more complicated than that, Greg. In many situations the future is unpredictable, as Aristotle noted in his “sea-battle tomorrow” argument. People often make decisions about the future: making a specific investment, choosing a major in college, deciding to take one job offer instead of another, etc. They generally believe that their choices will work out for them, even though past experience shows that doesn’t always happen. You can improve your outcomes by obtaining additional information at a cost not exceeding the benefits of the information. But in many cases, it is not possible to obtain enough evidence to guarantee a desired result. The key is basing your beliefs and the ensuing decisions on information that would be adequate for a prudent person (due diligence). Beliefs based on little or no credible information are of little worth. Beliefs based on adequate information are better. Monitoring progress and making adjustments if and when possible and indicated is still a good idea. Circling back to the subject of religion, it can neither be proved that there is or is not a God. However there are plenty of credible arguments on both sides. I made a decision to believe in the affirmative, and it’s worked well for me and people close to me. Your mileage may vary. Thus demonstrating exactly my thesis that what counts in a theory is not truth content – which is unknowable – but functional effectiveness – what benefits to survival a particular metaphysical view brings to the party. Belief in God has benefit irrespective of the actual existence of said God. It is a way of encapsulating a huge collection of attitudes, moralities, and philosophical uncertainties, into a system of actions and beliefs. Thank you for the thoughtful response, Leo. I agree that functional effectiveness is a very compelling consideration. However I have to disagree with the idea that the truth value of a theory is completely unknowable. In many situations we have probabilities which we can use to inform decisions–for example, 50% for heads, 1/6 for any given number on a cubic die. Ontological situations–where something either does or doesn’t exist–don’t have to default to being completely unknowable either. Evidence and credible arguments can help an individual estimate subjective probabilities based on personal criteria, which may be greater than 0% and less than 100%. As an analogy, despite the problem of “underdetermination” in science, among other things the “unreasonable effectiveness of mathematics” enables us to have a greater degree of certainty than is warranted by the underlying observations. In a sense, you can “know” more than you can know. If someone encounters God it seems to throw theories of the existence of God out of play. Jewish /Christian and Muslim encounters with God are not theories but are the basis of these faiths. They happened without being requested by the people who were encountered who were overcome by the experience. You can say they never happened because you don’t believe they ever happened , of course. A rather weak argument, I think , if you will excuse me for being uncivil. Calculations based on Lake Nyos show that volcanic CO2 may be underestimated by one order of magnitude, possibly more. It is funny they always circle back to”Give us your money!” in one way or another. In a totally unrelated aside, what are your thoughts on the system currently moving along 10th parallel developing into a hurricane? I got a $5 riding on it making by 01:00 7/9/18. nullschool is what I have mainly been watching it on, appears steady over the last 48 hours. Accuweather listing it as 35mph sustained,45mph gusts, moving west 16-18 mph. Was with some guys Sunday getting gear together for standby to go south after storms this season, we got to pool going on this system then. Thats the Sunday School version Joe. In reality modern man’s relentless, hubristic, pursuit of personal wealth and power has altered virtually every square inch on the planet. Never has a single species had such an impact over a few short decades. Ironic that this god-like ability to level mountain and smite whole ecosytems is accompanied by such blinkered delusion. Suggested reading: The Goose that laid Golden eggs. How about modern man’s relentless, hubristic, pursuit of collective wealth and power, as in the very un-ecological XSSR and China? Does that get a pass? Nature wasn’t laying any golden eggs for us. The goose hasn’t been cooked; in some ways it’s thriving, what with the planet’s recent greening. What, greening caused by humans? The associated image of the cloud in this post is absolutely stunning! A good look at the underside where all the action is. The NYT is sometimes referred to a the “old grey lady.” This is consistent with its anagram, “really dodgy.” Random accident? Or cosmic joke? Monkeys write is funnier, and perhaps more descriptive. It seems we have to live with the fact that modern journalism works this way. They almost can’t help themselves when they include the favoured explanation de-jour when trying to big-up stories into something more significant or scary. Today I saw a great example at the BBC. They reported the apparent poisoning of two more unlucky people with the nerve agent Novichok. The article explained that is likely the result of the agent being carelessly disposed of at some other location than that of the original deliberate attack. The article then went on to say that this must raise questions about the effectiveness of the decontamination of the, unrelated, sites visited by the victims of the original attack. Sites which the latest couple are not thought to have visited. The BBC thus completely contradicted themselves, 100%, in one short article. Complete and utter F-wits. Their desire to make it more frightening than it already was completely over-rode their logic circuits. The problem with journalism is that there is no incentive to be objective and neutral. If you want readers you need to get people’s attention and the way to do that is to create big dramatic headlines in all caps. When you do this, people buy your stuff, and when they buy your stuff, you get paid, which allows you to produce more content. Well-reasoned intelligent and neutral article just doesn’t get as much readers. And many of them fail to pass that class..
Or invent someone who lies.. I heard it on good authority that the Pope is in fact a transgender space goat. Using obtuse verbiage to hide actual intent is the hallmark of grifters, conmen and politicians. So clearly anyone using such is not a scientist. Say what you mean and mean what you say, and back it up with actual evidence. THAT used to be the scientific way. Grifters, conmen, and politicians. The is the first line in the definition of lawyer. Didn’t want to be repeatedly repetitive. Truly there are plenty of “ambulance chasers”, but there are also “Atticus Finch’s”. When I swim in the ocean, I contribute to sea level rise, if it is cold water some of that rise will be permanent. Rainfall and rivers also contribute to sea level rise. Good grief. There is a 100% correlation between consumption of water and death. It’s more like a bell curve, where X-axis is rate of water consumption (mass)/mass of consumer, and Y-axis is survival time under that rate. How is it a debate when one side is lying? Seems more like an exercise in futility. Objective debate has been stifled since the inception of the IPCC for the sole reason that it would jeopardize their reason to exist. So, they claim their fake science is ‘settled’ in order to remain viable by replacing debate with self righteous indignation. Like the ‘feedback’ and the basic equations of presumed climate change, the terms of reference on which the IPCC was set up are buried very very deep. But they can be found, and they show that the IPCC has no remit whatsoever to investigate and verify the validity if the man made global warming/climate change proposition. It is an organisation whose stated purpose is, by analogy, to examine the frequency and severity of your wife-beatings, and the effect these will have upon the children. It is not constituted to examine the question of whether or not such beatings are in fact taking place. The Intergovernmental Panel on Climate Change (IPCC) was jointly established by the World Meteorological Organization (WMO) and the United Nations Environment Programme (UNEP) in 1988. The terms of reference include: (i) to assess available scientific and socio-economic information on climate change and its impacts and on the options for mitigating climate change and adapting to it and (ii) to provide, on request, scientific/ technological/socio-economic advice to the Conference of the Parties (CoP) to the United Nations Framework Convention on Climate Change (UNFCCC). From 1990, the IPCC has produced a series of Assessment Reports, Special Reports, Technical Papers, methodologies and other products that have become standard works of reference, widely used by policymakers, scientists and other experts. This volume, which forms part of the Third Assessment Report (TAR), has been produced by Working Group III (WGIII) of the IPCC and focuses on the mitigation of climate change. It consists of 10 chapters covering the technological and biological options to mitigate climate change, their costs and ancillary benefits, the barriers to their implementation, and policies, measures and instruments to overcome these barriers. As is usual in the IPCC, success in producing this report has depended first and foremost on the knowledge, enthusiasm and co-operation of many hundreds of experts worldwide, in many related but different disciplines. We would like to express our gratitude to all the Co-ordinating Lead Authors, Lead Authors, Contributing Authors, Review Editors and Reviewers. These individuals have devoted enormous time and effort to produce this report and we are extremely grateful for their commitment to the IPCC process. We would like to thank the staff of the WGIII Technical Support Unit (TSU) and the IPCC Secretariat for their dedication in co-ordinating the production of another successful IPCC report. We are also grateful to the governments, who have supported their scientists’ participation in the IPCC process and who have contributed to the IPCC Trust Fund to provide for the essential participation of experts from developing countries and countries with economies in transition. We would like to express our appreciation to the governments of The Netherlands, Norway, Germany and South Africa, who hosted drafting sessions in their countries, to the government of Ghana, who hosted the 6th session of Working Group III for official consideration and acceptance of the report in Accra, and again to the government of The Netherlands, who funded the WGIII Technical Support Unit. We would particularly like to thank Dr. Robert Watson, Chairman of the IPCC, for his sound direction and tireless and able guidance of the IPCC, to Dr. Sundararaman, the Secretary of the IPCC and his staff for the secretarial support, and Professor Ogunlade Davidson and Dr. Bert Metz, the Co-Chairmen of Working Group III, for their skilful leadership of Working Group III through the production of this report. Nowhere in that, does it say that its purpose or function is to assess whether or not man made climate change actually exists. It bases its existence on the assumption, that it does. Lies and truth are relative to the individuals world view. And the language it is expressed in. “The burglements are invalidative tonight” has truth content if it is known to what entities and qualities the words refer, and the shared experience of two+ people about the world does not invalidate the statement. That is the burglements are demonstrably NOT invalidative tonight. For many in the climate change community, the core assumption behind the IPCC and all alarmism is to not actually address the question as to whether the earth’s climate is changing unusually, and that this is down to human activity, but to assert that the ‘science is settled’ therefore all that matters is plotting what the predicted effect on the ecosystem will in fact be. … and the phrase, “very likely”. My favorite “weasel word” is “robust”. I, however, DO like “consistent with”. These words show a consciousness of a connection that suggests the possibility of causality, and can lead one to discover or not discover causality, if one discovers INconsistency. You gotta use some kind of words. If everybody chose their own preferred manner of speaking as THE only way to speak, then language would become very bland, rigid, inflexible, and borrrrrrrrrrrrrrrring. I guess it depends on what segment of society you operate in. Do doctors get tired of the word, “stat” ? Do police officers get tired of the words, “You have the right to remain silent” ? Do farmers get tired of the words, “fertilize”, “pest”, “rotate” ? When is a word misused ? When is a word meaningless and dysfunctional ? Rather than dis using the phrase, “contribute to” (or any phrase), entirely, it might be best to qualify how it is MISused, and why we might avoid misusing it this way. Typing these words “contributed to” climate change, … in a very minor, piss-ant amount that’s not even worth considering. [See ? — I qualified it] This is a “robust” approach to using language correctly, “consistent with” a high degree of intelligence. The phrase ‘could be consistent with’ might convey the idea better as the uncertainty is also represented. One problem with so much of what passes for climate science is its contribution to the deprecation of uncertainty. I read that this morning and first thought was”Where is your gun, fool?” A fishing area known to be frequented by bears, you go armed constantly. With apologies to The Planet, I admit that our AC has been running nearly non-stop for almost a week now during this heat wave in the Northeast (and elsewhere), thus “contributing to” “climate change”. Now, where do I go to buy my carbon indulgences for my carbon sins? Hockey in the desert = more hockey sticks! I though Climate Whatever proponents liked hockey sticks. What Scientists really mean when they say things. Authoritative statements in scientific journals should not always be taken literally. I.J.Good has made a collection of them. I haven’t bothered to look up the original reference. The experiment didn’t work out, but I figured I could at least get a publication out of it. Composition unknown except for the exaggerated claim of the suppliers. This isn’t very good, but neither is any of the others on this miserable subject. The results on the others didn’t make sense and were ignored. I might possibly get around to this some time. It is impossible to tell from the micrograph. He was a student of mine. I have such a good answer to this question that I’ll raise it. (i) I happen to know it, or (ii) well known to some of us. (i)Not in the least, or if it really is: (ii)I was not the first to think of it, but I think I got it independently. From “Eureka: A book of scientific anecdotes”, by Adrian Berry. It works in context of the previous statement. Maybe someone can answer a question I have about the effect of CO2. If I point my infra red thermometer at a clear blue sky it will read very low temperature or err meaning the temperature is below the range of the device which is-40F. If I point it at the bottom of a low cloud it will read maybe 50-70F. The cloud is radiating infra-red at the temperature of the atmosphere at that elevation. So why doesn’t CO2 or water vapor do the same thing? Can anyone tell me? It’s about signal to noise ratio. In clear sky conditions your meter isn’t receiving enough energy to get above background noise. If you had an LN2 cooled sensor and appropriate shielding you might get a better result. -40F is 233K, corresponding to an energy flux, per SB, of 167 W/m^2. 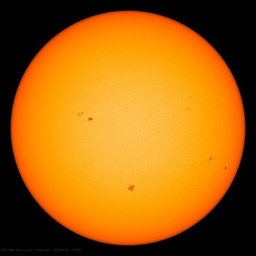 Given that the surface only needs about 150 W/m^2 to replenish emissions above and beyond 240 W/m^2 of incident solar forcing, your measurements are consistent with the physics. I would even expect to see even lower readings when the humidity is also very low. Remember that what you’re reading for the clear sky is the EQUIVALENT temperature of sensed LWIR returned from atmospheric GHG’s and not the actual temperature of some radiating body as is the case with clouds which also includes the emissions of solar energy absorbed by the water in the clouds. The sensor can’t tell the difference. You’ve noticed what I’ve been saying for decades and which has a very easy test that you’ve confirmed, which is that clouds and GHG’s have the same kind of radiative warming effect on the surface, except that clouds have a far larger influence, being broadband, rather than narrow band like GHG’s and by covering 2/3 of the planet. In both cases, you are probably reading a little high as it’s hard to measure ONLY the downward flux unless the sensor is flat on the ground and yet well insulated from the ground temperature. I suppose that if a refrigeration system is installed to create enough ice to play hockey in Las Vegas, the heat must be rejected to the atmosphere (via the refrigerant condensers). But the impact on temperature wouldn’t even be measurable a mile from the hockey rink. The air conditioners of hotels in Las Vegas would probably heat up the air much more than the hockey rink, but has anyone ever seriously considered removing air conditioners from Las Vegas hotels? They would lose most of their business in the summer! But since Michael Mann’s now-discredited graph was called a hockey stick, global warming must be blamed on hockey! Why not use the heat exchangers to make hot water for the hotel? It’s a safe bet that the architects have done everything that makes economic sense to cut energy costs. I got news for you. All the heat produced from all the A/C in the Las Vegas Valley is a drop in the bucket when the high air temperatures here (Henderson, NV) have been consistently over 100 each day for the past several weeks. In other words, it’s not noticed and may not be measurable only a couple miles away. To expect warmest (leftist) politicians to act intelligently is short sighted, their bread and butter is the crisis. If they can convince enough people to believe in the latest crisis they have contrived (in this case catestrophic human induced global warming) they can get them to act emotionally, irrationally to support whatever “solution” they say is necessary. This solution always means more power for them, more money for them, and less freedom, power, and money for us. “Energy from the sun drives all weather on Earth. Sunlight falls directly on the Equator and Tropical Regions, where much energy is absorbed. Sunlight falls indirectly on Polar Regions. All elements of Earth’s weather, storm fronts, hurricanes, the jet stream, and even ocean currents, are driven to redistribute energy from the tropics to the poles”. Except that it ignores a few things that actually make atmospheric flow. Earth’s orbit around the sun plays a very big part as well. Earth’s axial tilt, rotational speed, lunar gravitational tugging, Earth’s gravity (density effects) and a few more things actually cause the circum-global forces which create the great flows in the oceans and atmosphere. BTW the sunlight falls directly on the polar regions, just obliquely through the atmosphere. Every time I light a match, I contribute to heating the environment——which may be a good thing, since there is no proof that a warmer climate wouldn’t be more beneficial to our species. Someone ought to compute The New York Time’s contribution to climate change (and publish it). Missing a big variable on the chart — total mass of the atmosphere. This affects planetary climate far more than composition. I had read that as implied with the thermal mass mentioned (which isn’t exactly the same, but given that most of both are the same substances it goes hand in hand). Except that man is responsible for (near) the full one of these four molecules, not a fraction of it. Another point: quantities in CO2 “reservoirs” like the oceans don’t contribute, as long as these are not exchanged. CO2 exchanges between reservoirs don’t contribute, as long as inputs and outputs are equal. Are you suggesting that 25% of all the CO2 in the atmosphere is due to man? At least 12.5% probably is and up to 25% might be. While our annual contribution is minuscule, over the past 150 years, we have moved a lot of carbon out of geologic sequestration and into the active carbon cycle. While each individual molecule of CO2 has a brief residence time in the atmosphere, it takes more time (maybe >500 years) for the anthropogenic carbon to move back into geologic sequestration (E-folding time). Every source of preindustrial CO2 estimates, apart from Antarctic ice cores, indicates that CO2 could have risen from 280 to 320-350 ppmv without human assistance… But, at least 50 ppmv is on us… And not terribly relevant to the climate or marine geochemistry. Just a matter of balance: at least since the Mauna Loa and South Pole measurements started, humans in average have added twice the amount of CO2 each year than was measured as increase in the atmosphere. In every year, there were more human emissions than increase, thus in every year nature was a net sink for CO2, despite the huge (mostly seasonal) in/out fluxes between atmosphere and oceans/vegetation. Both the oceans and vegetation are proven, increasing sinks for CO2, thus not the cause of the increase. Another weasel phrase is, “emerging science suggests…” I hear on TV ads. Within the Greenie ideology, every human child born “contributes to” the death of our planet. Nice photo at the top of an atmospheric action “contributing to” – – weather. I just remembered that I was having a discussion with my sister this morning about foolish words, but the particular words under discussion were not associated with climate “science”. I assume that the day is supposed to be blessed by a higher power in my favor. But, assuming a person believed in a higher power, how can I be the one to HAVE this blessedness, if the higher power does not bestow it upon me ? It’s not up to me to HAVE it. No matter how badly I might WANT it or how badly YOU might want it for me, I cannot HAVE it, unless the higher power signs off on it. Just telling me to HAVE it is like telling me to usurp this power from the source and bestow the blessedness upon myself, no matter what the higher power might think of it. Are you telling me that I can have it no matter what the higher power might think? Maybe the higher power does not want me to have it, and yet you tell me to have it anyway. Again, its not up to me ! Why do you tell me to have something that requires a higher power to sign off on it first ? Have you personally cleared this with the higher power, before instructing me to accept it ? Anyhow, that was the gist of the conversation. Even though I do not operate on the premise of a sentient higher power, I could gladly deal with a less foolish phrase, like, “May you have a blessed day” or “I hope your day is blessed”, but just telling me to HAVE it is far too presumptuous and out of touch with how such blessedness is, in faith, acquired. Okay, I’d best try to relate this to the topic, for fear of having an off-topic rant killed in moderation. What would a climate alarmist tell you as a parting wish of good fortune ? — “Have a zero-carbon day” ?? It is shorthand for (May you) have a blessed day. Oh crap !!! (I think) ? The snowflakes are probably wetting themselves with joy over this. Let them. It will be all the sweeter when they realize they haven’t won a thing. “contributing to climate change” is a meaningless phrase. Since ‘climate change’ is a meaningless phrase, ‘contributing to climate change’ is meaningless. That question is relatively simple and the answer well known. But then straight to the disingenuous talking points…sigh. “Every day, nature puts about 20 times as much carbon dioxide into the atmosphere as all of human industry”. That is the parrotted garbage that “contributes” to the deliberate misinformation and doubt-mongering of vested interests. Shame. “Sir, would you like to make a contribution to Climate Change?” Ans: Apparently, I already am. I gave at the office (literally… I’m a petroleum geologist). Steve, instead of just criticizing, why not provide a suggestion? It’s like they are not taking Climate Change seriously. Perhaps I missed the MSM headlines on this, but with the steady drum beat that we are destroying the environment, how many people know that the “U.S. has been reducing CO2 emissions faster than any other nation on Earth over the last decade”? My favourite is any action by the luvvies is to “tackle” climate change. Tackling is big in Climate World.